Elderberries have been used for many, many years for natural health. I always have some dried elderberries on hand to make syrups, but I have recently discovered tinctures as well. It’s been my first source of cold and flu prevention in our family for a long time along a good diet, plenty of rest and good hand washing to help as well. I like the tinctures myself, because they are quickly absorbed and since it’s in alcohol, shelf life is nearly indefinite. You will need dried elderberries and alcohol. Best part of making your own medicines? Having lots of different boozes on hand 😉 Anyway, I used vodka for mine, but you can use rum, or brandy as well. You want the higher proof alcohol, the 80% kind to get the best extract for this. 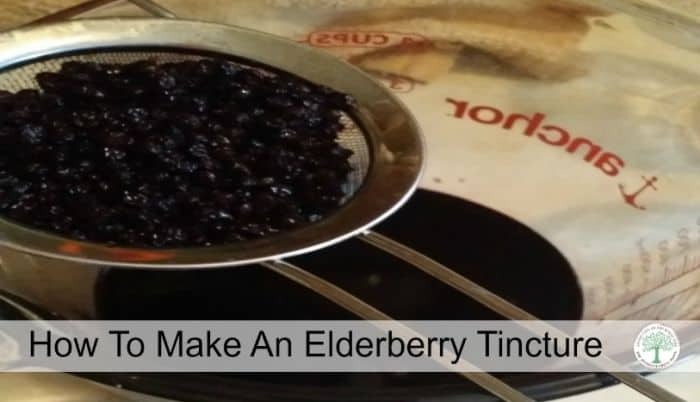 In a pint jar, place 1 cup of the dried elderberries and cover with the alcohol. Cap tightly and shake it up. Every day or so for the next 6 weeks, when you think about it, give it another good shake. After 6 weeks, strain the elderberries off and discard to the compost pile. Place your tincture in a glass bottle with a dropper and store in a dark, cool place. for my hubby, myself and our older teens, I place 3-4 drops directly under the tongue 3 times a day when we are feeling under the weather. During the winter, when the days are shorter and sunlight is at a minimum, I use 3 drops for each of us once a day. For my younger kids, ages 7-10, I use 2 drops under the tongue when feeling under the weather 3 times a day and one drop daily as maintenance. What are some of your favorite natural cold symptom relievers? Will you make an elderberry tincture this season? We have used elderberry, both homemade and store-bought, but not consistently. I am definitely going to start up again this season! Thanks for sharing! I’m going to start making my own elderberry tincture, so thank you for the recipe! Wow. That’s just too easy! We happen to have a lot of elderberry bushes too. Now I have something to do with them! We fortunately live in an area where I have access to fresh elderberries, can I use fresh elderberries in this or would you have to use dried? Raw elderberris can be toxic…so what you would need to do is to dry them or cook them thoroughly THEN use the in a tincture. Or, a syrup.